After a Friday that saw all sessions hampered by rain and damp, Saturday dawned in the northern Netherlands with brighter skies. With the track surface initially wet, activity on the circuit meant a dry line began to emerge and, aided by the wind, Tissot-Superpole saw riders able to go on the attack on a dry track. KRT rider Tom Sykes took pole with a blistering lap of 1’35.440 to head the field by more than half a second. With dry setup time so curtailed, the session got underway with Leon Camier leading the charge to Superpole 2, as the Brit set a number of timesheet-topping laps that saw the red helmet remain next to his name throughout the majority of the session. After a tough day for BMW in the first wet conditions of the year on Friday, the drier track for Superpole 1 saw them find form once again, with reigning British national Champion Josh Brookes’ Milwaukee machine hot on Camier’s tail. In the dying minutes, the Althea BMW pairing of Torres and Reiterberger showed their hand and traded fastest laps, with the German coming out on top and heading the double graduation for the Althea team. 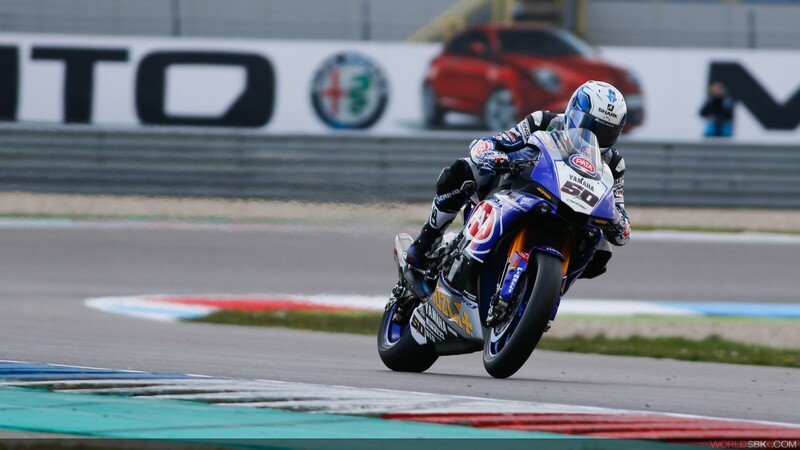 Reiterberger, although a WorldSBK rookie, is well-versed in the secret to going fast at the Circuit van Drenthe, as he did the double in 2015 riding in the IDM: successes that saw him seal the national crown. 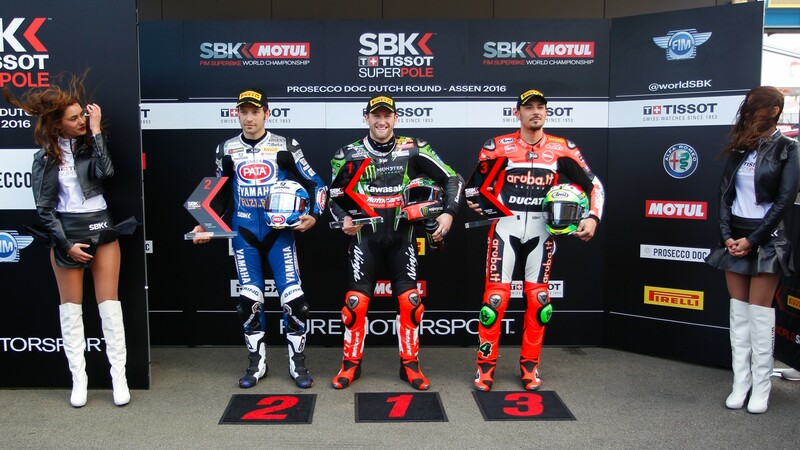 Tissot-Superpole 2 saw the first fastest laps coming in from a three bike train of Rea, Davies and van der Mark, with the Dutchman taking over at the top until Sylvain Guintoli and Tom Sykes fought back. In the final few minutes on the final push to the line, it was KRT rider Sykes who put in a blistering 1’35.440 to take pole, with a gap of more than sixth tenths of a second to nearest challenger Sylvain Guintoli on his Yamaha, who starts from the front row once again after a great qualifying performance in Aragón. 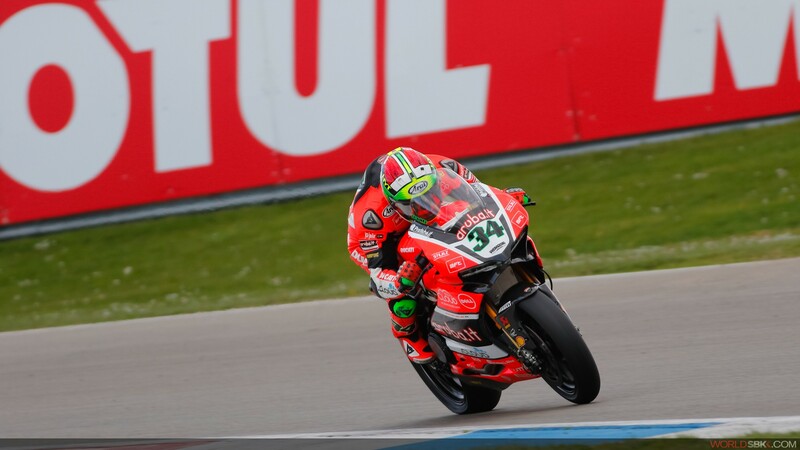 Davide Giugliano was the best qualified Ducati in P3 for a front row start, just ahead of reigning Champion Jonathan Rea, who improved his time to move up to the second row on his final attempt. Local hero Michael van der Mark jumped from P9 on the combined times on Friday to P5 in Tissot-Superpole, starting alongside the reigning Champion and ready to challenge those in front of him. 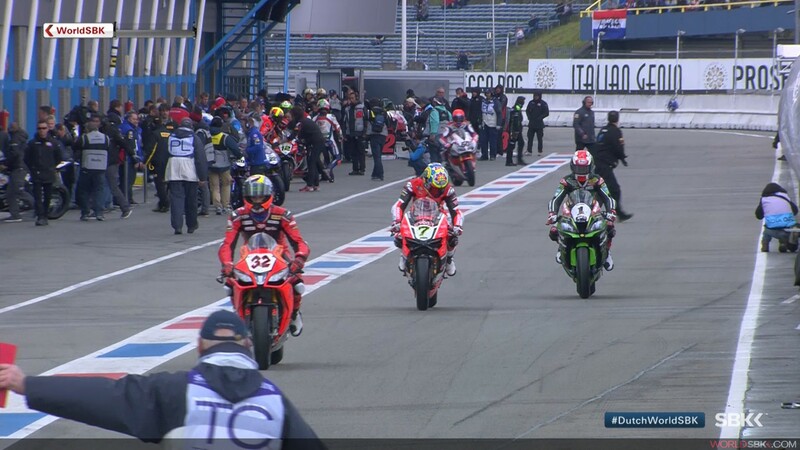 Chaz Davies on the second Aruba.it Ducati will start from 6th at Assen, just ahead of Markus Reiterberger on the first Althea BMW, who carried his great form from Superpole 1 into Superpole 2. 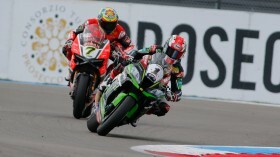 Forés, Torres and Hayden locked out the top ten, ahead of leading Aprilia Lorenzo Savadori. Alex Lowes was the biggest casualty in Superpole 2, as the Brit lost his YZF R1 at T18 on his final flying lap. 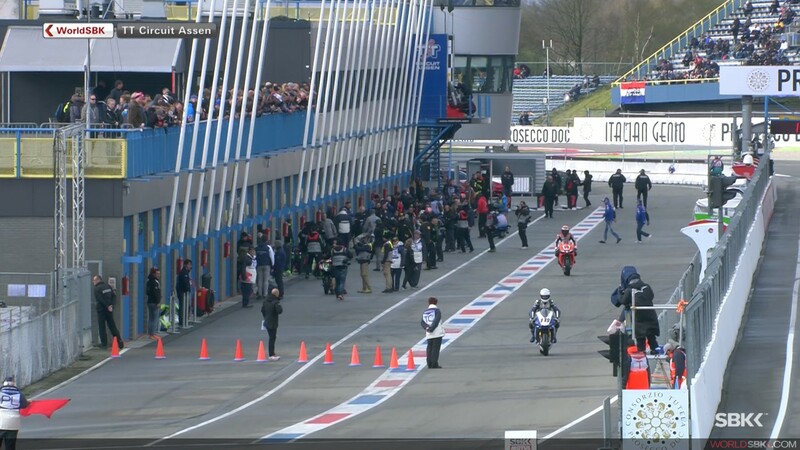 Teammate Guintoli’s front row shows however that the Yamaha could be a force to be reckoned with at Assen once the lights go out for the first race at 13:00 local time (GMT +2).